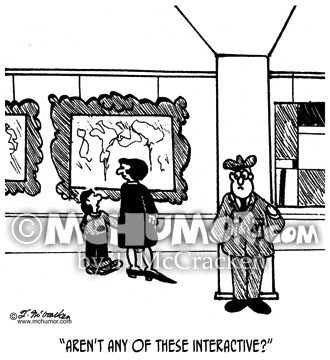 Painting Cartoon 3729: A kid in an art museum asks his mother, "Aren't any of these interactive?" 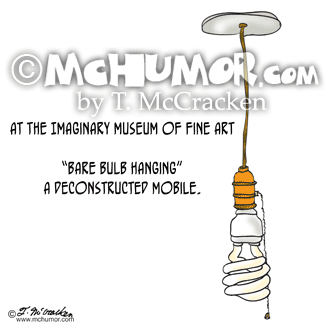 Art Cartoon 9162: At a museum people look at a mop and bucket next to paintings and sculpture. 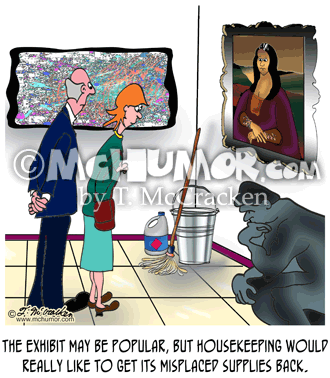 "The exhibit may be popular, but housekeeping would really like to get its misplaced supplies back." 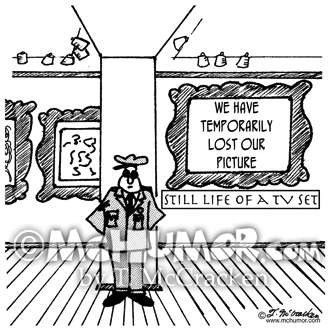 Museum Cartoon 7744: A sign in an empty frame at a museum says, "We have temporarily lost our picture." 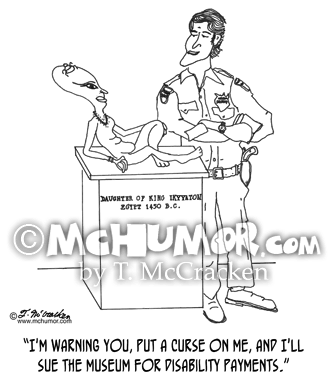 "Still Life of a TV Set." 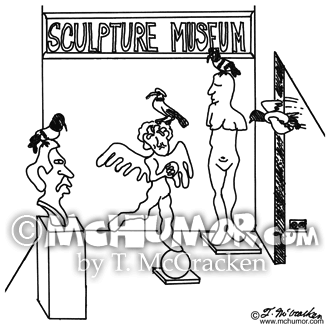 Sculpture Cartoon 0246: Pigeons fly into an art museum and perch on sculptures. 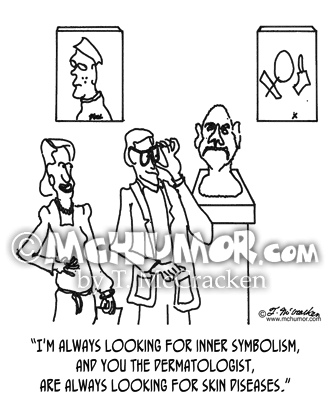 Dermatology Cartoon 0437: In an art museum a woman says to a man studying a sculpture, "I'm always looking for inner symbolism, and you the dermatologist, are always looking for skin diseases." 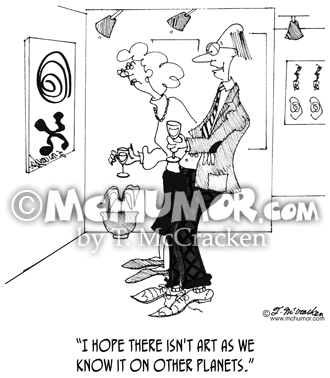 Art Cartoon 6053: A man looking at a piece of modern art, "I hope there isn't art as we know it on other planets." 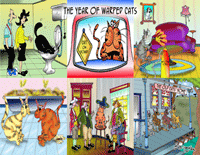 Museum Cartoon 1367: At the "Museum of Tacky Art: Velvet Paintings, 1st Floor, Sad-Eyed Dogs 2nd Flour, Souvenir Figurines, 3rd Floor. 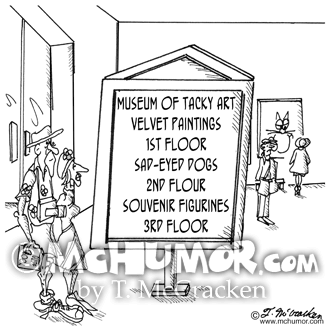 Museum Cartoon 1367: At the "Museum of Tacky Art: Velvet Paintings, 1st Floor, Sad-Eyed Dogs 2nd Flour, Souvenir Figurines, 3rd Floor. 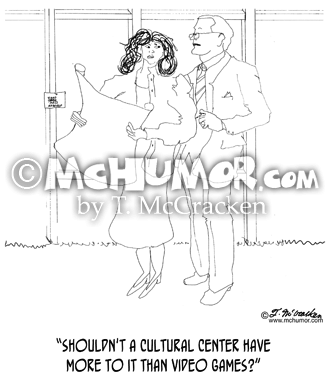 Architecture Cartoon 0137: Someone asks an architect, "Shouldn't a cultural center have more to it than video games?"